There are partially restored battle structures from the Second World War (Winter War between Finland and the Soviet Union 1939-40) at Cape Petraniemi. The remains of wartime horse shelters can be found at Lake Joutenjärvi. No actual battles were fought in the park's area, but they took place at Oinassalmi Sound near the park. Traditionally winter feed for livestock was gathered from flooded fen meadows. There are 20 hectares of flood meadows in the National Park. These days the 1,9 hectares of flood meadow, which is located between Lakes Kuikkalampi and Petkeljärvi, is managed by traditional methods whenever the hay is long enough to cut. The hay is then dried on wooden stacks. 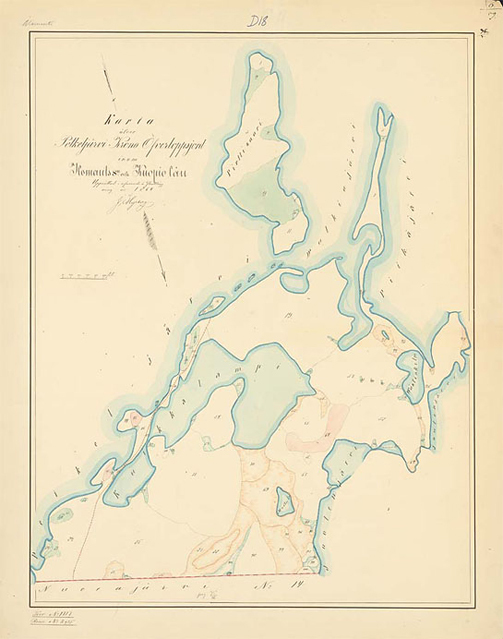 In the 1800s the Petkeljärvi National Park area was considered surplus land, which was owned by the government. During the "Great Land Ordinance" of 1832 the area became public land, which inhabitants from surrounding villages could use as they pleased. Part of this area was meadow and slash-and-burn fires burned there occasionally. Local industries were also interested in using the areas forests. The owners of the ironworks at Möhkö planned to get firewood for his ovens from this public land. The governor of the province did not however want the value of the area's forests to decrease and did not grant permission for the ironworks to utilise the areas wood supply. The idea for naming Petkeljärvi a protected area was born before the First World War and the area was conserved from 1933 onward. After the World Wars there was a need to establish new National Parks and strict nature reserves because two out of four of the National Parks established in 1938 were located on lands lost to Russia during the wars. Potential sites for new National Parks were put forward by natural science organisations, but at Petkeljärvi the inhabitants themselves were also active in vying for their area. In 1957 work began to develop the National Park for recreational use. New signs were painted and placed in the area and parts of the area's hiking trail got steps. In order to make the National Park easier for hikers to reach construction of a road from Oinassalmi to Petraniemi was initiated. Pekka Tolvanen the foreman in the Ilomantsi area remembers how the path was cleared for the road. At first the trees along the path had to be felled and workmen had to be accurate. The trees had to fall in a way that made them as easy as possible to move away from the area. Trees were shifted and taken away by horses because at that time there were still many of them available in the Ilomantsi area. Some of the felled wood was made into planks and beams at the location. There were later used in building the park ranger's cabin there. Work on Petraniemi Camping Ground began in 1960 when a cooking shelter and other structures were built there. The camping ground became a popular tourist spot its first summer and has stayed that way. Many associations and organisations stayed at the National Park during hiking excursions. "Forest and landscape which have been preserved in their natural state seem to continually interest people as a counterbalance for the manic rhythm of the rest of the world. This interest has ensured that the number of visitors to the National has grown each year. This past summer was rainy and yet there were more visitors than during the previous summer. There were 9,000 visitors of whom 4,000 stayed at the camping ground and 5,000 came on day-trips. About 3,000 cars, 900 motorcycles and 1,200 scooters and bicycles travelled along the road leading to the National Park." The number of visitors to the National Park rose steadily throughout the 1960s. Just a couple of years after Vilho Kärki's comment the overnight visitor count was at 13,400 for one summer." In 2013 there were an estimated 20,000 visitors to Petkeljärvi National Park. Reference: Kumpulainen, Jouni: Petkeljärven kansallispuiston historiaselvitys (Historical Research of Petkeljärvi National Park), Metsähallitus, 2005. Read more on the beginning stages of our National Parks. Many of the best aspects of Finnish nature are represented in Petkeljärvi National Park. There are grand ridges, clear lakes and impressive old-growth pine forests. Visitors can see all of these during one day, following the National Park's short hiking trails. Trails travel up and down ridges from where glittering lake waters come to view from between trees. Visitors can also set off on longer hikes from Petkeljärvi as Taitajan taival Trail (35 km), the longest hiking trail North Karelia, has its starting point there. Petkeljärvi Outdoor Centre is located at the tip of Cape Petraniemi at the end of the road leading to the National Park. There are very few National Parks, which have a restaurant or a place to lodge right in their centre. During summer hikers can start their mornings by hearing the call of the Arctic Loon (Gavia arctica) and take a canoe or rowboat trip on Lake Valkiajärvi. Petkeljärvi Nature Information Hut is situated right next to the Outdoor Centre. The exhibit at the hut tells of the importance of conserving ridges and their natural features. At Cape Petraniemi visitors can view partially restored war-time structures, such as a dugout and a trench. There is an old park ranger cabin by the road leading to Petkeljärvi National Park. Basic repairs have been carried out on the cabin and it has been furnished in the style it would have been in the 1960s. The cabin has displays on the National Park's history. Tourism has long traditions at Petkeljärvi as in the 1960s there was a kiosk at the roadside, which was run by the park ranger. From it he sold souvenirs such as birch bark horns.